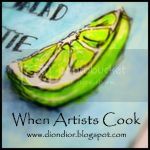 This post is part of "When Artists Cook," a series in which I am a guest writer. My previous posts in the series: "Coming of age in kitchens"
Harvest season always fills me with ________________________ . I’ve been mulling this over for the past month or so, as the garden peaks, the farmers markets flood with produce, and I write and rewrite the list of things to preserve for the winter. [ . . .] I tend to get a little ahead of myself when it comes to harvesting and preserving. By that I mean, there’s no limit for me. It’s never enough. As long as there is a nook or cranny in the house that is reasonably stable in temperature, and not exposed to much light, I am interested in filling it with food that will keep through, or at least into, the winter. Having a hands-on relationship with our food is one of my absolute favorite things about the mayhem that is harvest season. The kitchen is aswarm with fruit flies, which one cheeky friend describes as “indicators of abundance,” and the occasional stow-away earwig always shows up in the least expected corner. But, even when I’m busy picking snails out of the beet greens, or scrubbing tomato splatters off of...well, everywhere, this is still about as real as it gets.